This tap-rooted perennial herb grows to a height of 3 feet and is a common roadside flower in much of Texas. It is native to the southern Plains and adjacent Mexico (including the Edwards Plateau, South Texas Plains, and Trans-Pecos) but has become established throughout much of North America in historic times. The beautiful purple flower ripens into a globose fruit. The leaves are covered with silvery pubescence, giving the plant its common name. The stems are covered with sharp prickles that will surprise anyone who tries to pick the flowers. For native peoples it was a useful medicinal plant. Archeological occurrence. 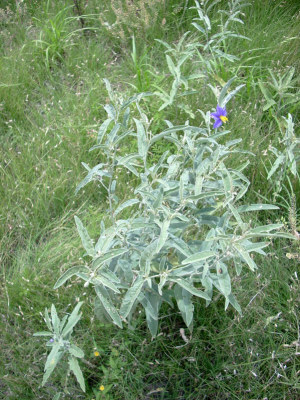 Although silverleaf nightshade has not been recovered from archeological sites in Texas, it is likely to be present in dry rockshelter deposits in the Lower Pecos Canyonlands because of its numerous medicinal uses. Medicine. Silverleaf nightshade is classified as a toxic or poisonous plant; poisonous both to cattle and humans. However, some birds feed on the fruits. The plant is rich in solanine, a poisonous glycoalkaloid that causes gastrointestinal, neurological, and coronary problems including emesis, stomach pains, dizziness, headaches, and arrhythmia (Boyd et al. 1984). It also contains the steroidal glycoalkaloid solanidine used in hormone synthesis. Glycoalkaloids from members of the nightshade family have been shown to be effective in variety of medical applications, including limiting growth of certain cancer cells and treating herpes complex viruses. The Zuni chewed the tap root of the plant and placed the maceration into a tooth cavity to ease the pain (Stevenson 1915). They considered silverleaf nightshade to be a "peoples' plant," an everyday remedy that could be used by anybody. Other observers have noted that the fruit was used for toothaches. The chewed root was applied as a poultice to snake bites. Also, in the treatment of snakebites, the medicine man would chew the root before sucking on the wound to extract the venom (Camazine and Bye 1980). The Navajo treated respiratory symptoms with the plant, including throat and nose problems (Elmore 1944). The Pima also used the crushed fruits a treatment for colds (Curtin 1984). Silverleaf nightshade was utilized as an eye treatment, most likely as a poultice (Elmore 1944). The Navajo used the plant to treat unspecified stomach ailments (Wyman and Harris 1941). In Sonora, Mexican folk healers used the plant, calling it buena mujer, to treat fits of sneezing (Martinez 1969). The fruits were utilized to treat constipation by either eating them or boiling them and then drinking a thick concoction (Jones 1931). The White Mountain Apache considered the plant to have medicinal qualities, but did not specify its use (Reagan 1928). Other. The Kiowa utilized the plant by pounding its leaves and mixing them with brains of recently killed animals to tan hides, specifically deer hide (Vestal and Schultes 1939). The plant contains enough enzymes to be used as a rennet, or digestive agent in milk (Boyd et al. 1984). The Navajo, the Pima, Cochiti, all used the fruit of the plant for this purpose. The Zuni mixed the fruit with goat's milk in order to curdle it. They considered this to be a delicious beverage. The Pima would powder the dried fruit (it dries on the plant) and place it in milk along with a piece of a rabbit or cow stomach in order to make cheese. An intriguing application of the fruit is illustrated by its use by nursing mothers to extend the period of lactation. This is interesting because members of the genus Solanum are rich in chemicals used as building blocks to synthesize birth control hormones. And finally, on a lighter note, the fruits were used as adornment. Keresan women made the fruits into necklaces. Boyd, J. W., D. S. Murray, and R. J. Tyrl. 1984. Silverleaf nightshade, Solanum elaeagnifolium, origin, distribution, and relation to man. Economic Botany 38:210-216. 1980	A Study of the Medical Ethnobotany Of The Zuni Indians of New Mexico. Journal of Ethnopharmacology 2:365-388. 1931	The Ethnobotany of the Isleta. Unpublished Masters thesis, University of New Mexico. Albuquerque, New Mexico. 1969	Las Plantas Medicinales de Mexico. Quinta Edicion. Ediciones Botas. Mexico, D.F. 1928	Plants Used by the White Mountain Apache Indians of Arizona. The Wisconsin Archeologist 8:143-161. 1939 The Economic Botany of the Kiowa Indians. Botanical Museum of Harvard University. Cambridge, Massachusetts. 1945	Notes on the Ethnobotany of the Keres. Papers of the Michigan Academy of Arts, Sciences and Letters 30:557-568. 1941	Navajo Indian Medical Ethnobotany. The University of New Mexico Bulletin, Anthropological Series 3(5). Albuquerque, New Mexico. Silverleaf nightshade near the Pecos River.